Did Jesus die on the cross or did He only swoon? Who should we believe: Jesus or Mirza Ghulam Ahmad? 1. The biblical evidence demonstrates Jesus died on the cross. Here they crucified him, and with him two others—one on each side and Jesus in the middle. “Let’s not tear it,” they said to one another. “Let’s decide by lot who will get it.” This happened that the scripture might be fulfilled which said, “They divided my garments among them and cast lots for my clothing.” So this is what the soldiers did. 2. The medical evidence demonstrates Jesus died on the cross. Clearly, the weight of historical and medical evidence indicates that Jesus was dead before the wound to his side was inflicted and supports the traditional view that the spear, thrust between his right rib, probably perforated not only the right lung but also the pericardium and heart and thereby ensured his death. Accordingly, interpretations based on the assumption that Jesus did not die on the cross appear to be at odds with modern medical knowledge.1William D. Edwards, MD; Wesley J. Gabel, MDiv; Floyd E. Hosmer, MS, AMI; “On the Physical Death of Jesus Christ”; Journal of the American Medical Association 21 March 1986; Volume 255, 1463. Josephus (Jewish historian born around 37 AD and died 100 AD) refers to Jesus’ death (Antiquities 18.3.3). Tacitus (AD 55-120), a renowned historian of ancient Rome wrote around 115 A.D. that Christ was “executed” by Pilate (Annals 15.44). The early enemies of Christianity (e.g., Celsus and Lucian), conceded that Jesus was put to death. …if anyone says to you, ‘Look, here is the Christ!’ or, ‘There he is!’ do not believe it. For false Christs and false prophets will appear and perform great signs and miracles to deceive even the elect—if that were possible. Friend, prayerfully consider these things and read the Gospel of Matthew. I invite you to embrace Christianity as the truth and only way of salvation. Jesus said, “I told you that you would die in your sins; if you do not believe that I am the one I claim to be, you will indeed die in your sins” (John 8:24). Believe in Jesus and be baptized for the forgiveness of your sins and you can have certainty that you will inherit eternal life. This certainty is rooted in what God has done in the real world with respect to the death of Jesus on the cross, His burial, resurrection, and ascension into heaven. Does Quran 23:50 teach Jesus did not die on the cross but went to India? Learn how God changed Nabeel Qureshi’s heart to believe in Jesus. Nabeel Qureshi was a convert to Christianity from Ahmadiyya Islam. Here is the story of his conversion. Watch Nabeel Qureshi, a convert to Christianity from Ahmadiyya Islam, discuss the Gospel of Barnabas. Ahmad, M. M. “The Lost Tribes of Israel: The Travels of Jesus”, Ahmadiyya Muslim Community. Hadhrat Mirza Ghulam Ahmad – comprehensive list of books written by Mirza Ghulam Ahmad. _________, “Fountain of Christianity.” — Hadrat Mirza Ghulam Ahmad makes false claims in this work about the Gospel of Barnabas and an ancient work entitled Yuz Asaf (pp.9-11). Ahmadiyya commentary on Quran 23:51 (traditional Islam follows a different system of versification and numbers this verse as 50, not 51), which they believe teaches Jesus went to Kashmir, India, The Holy Qur’an: With English Translation and Commentary, Volume 5 (Tilford, UK: Islam International Publications Limited, 1988), 1804. F.P. Cotterell, “The Gospel of Barnabas,” Vox Evangelica 10 (1977): 43-47. William D. Edwards, MD; Wesley J. Gabel, MDiv; Floyd E. Hosmer, MS, AMI; “On the Physical Death of Jesus Christ”; Journal of the American Medical Association 21 March 1986; Volume 255, 1455-1463. Yohanan Friedmann, Prophecy Continuous – Aspects of Ahmadi Religious Thought and Its Medieval Background; Oxford University Press (2003). 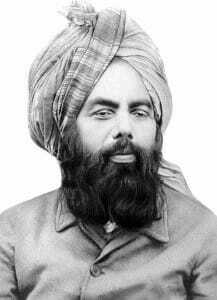 John Gilchrist, Muhammad and the Religion of Islam, chapter 9: A Study of the Ahmadiyya Movement. Günter Grönbold, Jesus In Indien, München: Kösel 1985. Philip Johnson, Did Jesus go to India? Norbert Klatt, Lebte Jesus in Indien?, Göttingen: Wallstein 1988. Matthew W. Maslen, Piers D. Mitchell, “Medical Theories on the Cause of Death in Crucifixion”; Journal of the Royal Society of Medicine; 2006:185-188. Christine Schirrmacher, “Has the True Gospel of Barnabas Been Found?“; Institute for Islamic Studies of the Evangelical Alliance in Germany, Austria, Switzerland. Steven Masood, Jesus and the Indian Messiah. Nicolai Notovitch, Unknown life of Saint Issa 1894. Lee Strobel, “The Medical Evidence: Was Jesus’ Death a Sham and His Resurrection a Hoax? in The Case for Easter. 1. ↥ William D. Edwards, MD; Wesley J. Gabel, MDiv; Floyd E. Hosmer, MS, AMI; “On the Physical Death of Jesus Christ”; Journal of the American Medical Association 21 March 1986; Volume 255, 1463.